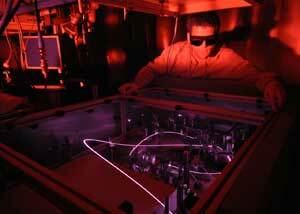 A laser is an optical amplifier - a device that strengthens light waves. Some lasers have a well-directed, very bright beam with a very specific color; other lasers emphasize different properties, such as extremely short pulses. The key feature is that the amplification makes light that is very well defined and reproducible, unlike ordinary light sources such as the sun or a lamp. The word "laser" is an acronym, standing for "light amplification by stimulated emission of radiation," and this accurately reflects how the early laser pioneers viewed these devices. Light consists of rapidly oscillating electric and magnetic waves, with different colors oscillating at different rates (red light oscillates about 5 x 1014, or 500 million million, times per second). Stimulated emission, first predicted by Einstein in 1917, relies on the quantum mechanical description of light as consisting of particles called photons, each with a well defined energy. It uses stored energy in a material (for example, energetic atoms or molecules) to make many nearly-identical copies of an incident photon. Stimulated emission sources were first demonstrated with microwave radiation (the "maser") in 1954. 2010 marks the fiftieth anniversary of the demonstration of this process with visible light (by Ted Maiman in May 1960), which presented many technical challenges that were not present with the maser. Most of the early lasers were really better understood as "oscillators" (single frequency sources, like a tuning fork for sound) than as sources of "amplification" but the acronym would then have been a lot less attractive. Over the last fifty years, our theoretical understanding of laser action has evolved tremendously, as has the variety and capability of modern laser systems. Lasers range in size from smaller than the diameter of a human hair to larger than a football stadium. The stored energy used for amplification can come from a solid, a liquid, a gas, or even a beam of electrons. Many modern lasers are widely tunable; laboratory laser systems can produce infrared, visible, or ultraviolet light on demand, or can even produce X-rays. In fact, for some lasers stimulated emission in the sense Einstein envisioned plays only a minor role. So in practice, modern lasers are easier to recognize than they are to define: a laser is a bright source of light that has very well defined and reproducible characteristics in time, space, or both. In contrast, ordinary light sources emit waves that fluctuate with time and position, although these fluctuations are often not observable to the naked eye. Lasers can be made to run continuously with a single well-defined frequency and wavelength, with an accuracy better than one part in 1016. This enables laser light to provide a standard for time and length scales. It provides a source so spectrally pure that it can be tuned to very narrow resonances in atoms and molecules, coupling so strongly that the internal states of the atoms and molecules can be manipulated with great precision, and allowing their thermal motion to be slowed so much that their temperature can be reduced to within a small fraction of a degree of absolute zero. Alternatively, they can be made to give extremely short pulses (less than 10-15 seconds long) which can capture ultrafast processes such as chemical reactions; such laser pulses intrinsically produce a broad spectrum of wavelengths all at the same time. Lasers can be made with beams that hardly diverge, so that their reflection from the mirrors placed on the moon by Apollo 11 can be measured on earth, or they can be made to uniformly illuminate large regions for manufacturing applications. They can be powerful enough to induce nuclear fusion, precise enough to replace scalpels, or gentle enough to reduce heating in a high speed computer processor. The electric and magnetic waves they produce can be very simple, or can be structured into astonishingly complex patterns (both in space and in time) for applications such as optical communications, medical imaging, and controlling chemical reactions. Both the unique properties and the flexibility of the laser make it an important part of modern life.